Key to all functional movements. Balance – When body is in equilibrium and stationary, meaning no linear or angular movement. Maintaining handstand without falling over. Dynamic Balance – ability to move and change directions under various conditions without falling. Running on uneven surfaces. Balance is dependent on internal and external factors to maintain body’s center of gravity over its base of support. Dynamic process involving multiple neurologic pathways. Research shows that specific kinetic chain imbalances(such as altered length-tension relationships, force-couple relationships, and arthrokinematics) can lead to altered balance and neuromuscular inefficiency. Flawed movement patterns alter firing order of muscles activated. 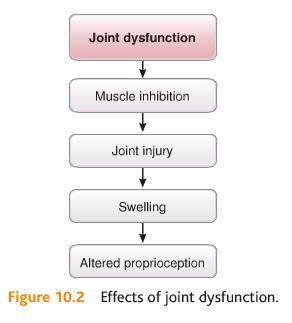 Joint dysfunction creates muscle inhibition. Leads to joint injury, swelling, interruption of sensory input from articular, ligamentous, and muscular mechanoreceptors to the central nervous system, results in clinically evident disturbance in proprioception. Sensory feedback to CNS is altered after ankle sprains, ligamentous injuries to the knee, and low-back pain. 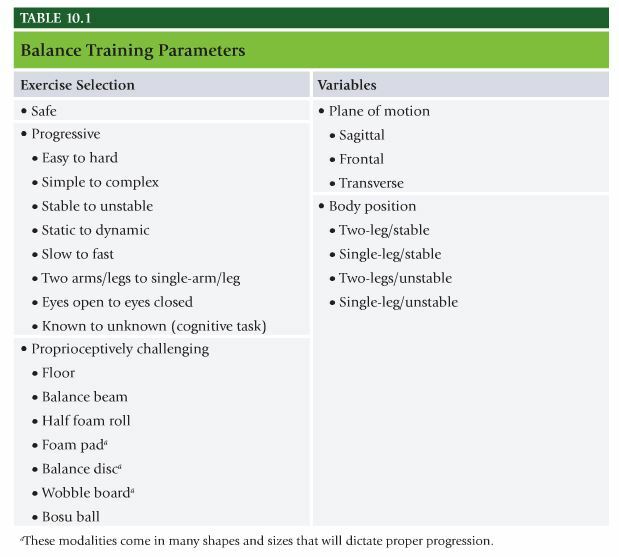 Balance training should stress individual’s limit of stability(or balance threshold). Limit of stability is distance outside of the base of support that he or she can move into without losing control of his or her center of gravity. Threshold must be stressed in multiplanar, proprioceptively enriched(unstable yet controlled) environment, using functional movement patterns to improve dynamic balance and neuromuscular efficiency. Research shows performing exercises that demand balance can reduce rate of ankle sprains and other lower extremity injuries. Part of ACL injury prevention programs. Integrated injury prevention programs that include balance exercises in addition to plyometric or strength greatly influenced ability to improve lower extremity biomechanics. Should be performed at least 10 mins a day, 3 times a week, for 4 weeks. Must be systematic and progressive. Main goal of balance training is to continually increase client’s awareness of his or her limit of stability(or kinesthetic awareness) by creating controlled instability. Three levels of training – stabilization, strength, and power. Proper balance training program follows same systematic progression. Surfaces change in difficulty as individual moves from stable surface(floor) to unstable surfaces(half foam roll, foam pad, balance disc). Eyes open is easier than eyes closed. Change one variable at a time. Involve little joint motion; instead are designed to improve reflexive(automatic) joint stabilization contractions to increase joint stability. Involve dynamic eccentric and concentric movement of balance leg, through full range of motion. Designed to develop proper deceleration ability to move body from dynamic state to a controlled stationary position, as well as high levels of eccentric strength, dynamic neuromuscular efficiency,and reactive joint stabilization. Exercises include: multiplanar hop with stabilization, multiplanar sing-leg box hop-up with stabilization, multiplanar single-leg box hop-down with stabilization.